It’s not the team’s best qualifying session so far in this young Formula One season, but Mercedes AMG Petronas will definitely take a pole position for Lewis Hamilton and a P4 start for Nico Rosberg, especially during a fairly wet and contested qualifying round at the 2014 Chinese Grand Prix. This markes Hamilton’s eighth pole position as a member of the Mercedes F1 team, but more importantly, it was his 34th overall pole, giving him the all-time record for a British driver. With wet conditions to start with, the Mercedes drivers went out on their wet tyres off the bat in Q1, with the intermediates being used for the next two phases. 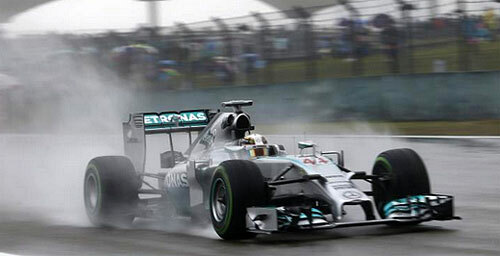 It was a welcome performance for Hamilton, who struggled a bit during the Friday practice. The Brit, who still trails Rosberg for the top spot in the drivers’ standings by 11 points, acknowledged the job the team has put in to make the car perform as it has, and that hopefully they can convert all this into a win in the race. Rosberg is ahead in the standings by virtue of finishing first, second, and second in the first three races, respectively. Hamilton had to retire in the first race, so he missed out on points there. Hamilton did get to win the last two races to cut his teammate’s lead. The German driver was quick to say that P4 is not such a bad place to start a race, but did admit some problems plaguing his car during the qualifying–not the least of which was a brake issue that caused a couple of lock-ups. He never really got to improve his time in Q3. See you at the race and check back for our rundown of the 2014 Chinese Grand Prix!